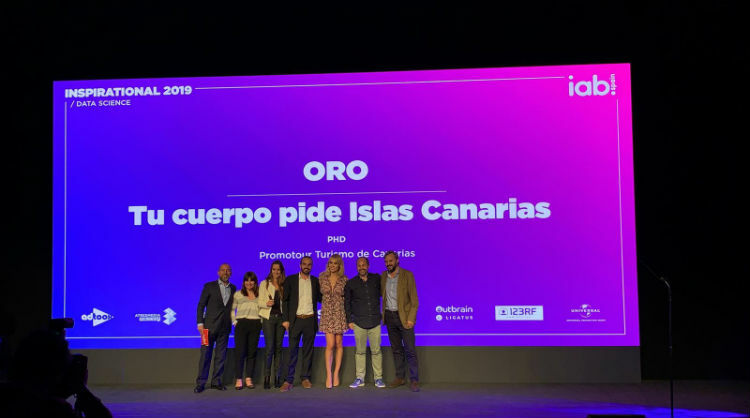 The Canary Islands brand has been awarded Gold for its innovative campaign entitled “Your body needs Canary Islands”, for the creative and intelligent way it takes users’ data stored on Facebook and generates personalized videos from it. This campaign achieved over 22 million views at traditional “sun and beach” tourism markets such as Norway, Sweden, Germany, Holland, Belgium, United Kingdom and Ireland, and its contents were translated into six languages. The prize was awarded on Monday, 8th April at the Círculo de Bellas Artes in Madrid, as part of the 12 annual Inspirational Festival organized by the Spanish Association of Advertising, Marketing and Digital Communication (or IAB Spain), which recognizes innovation in digital industry. The campaign used technology based on big data, which Facebook made available to Spanish brands for the first time, and made the short list in the category of “Data Science”, competing with other top brands including McDonald´s, Porsche, Diageo España and Cabify. “Your body needs Canary Islands” was a campaign launched in winter which used images of the archipelago, and crossed them with data by Facebook users, such as for example their city of residence, photos, their birthdays and how long it had been since they had been on holiday. The aim was to generate a personalized video in real time which would awaken the desire in people to enjoy a multitude of experiences on the islands with the best climate in the world. With this in mind, they didn’t create an exclusive, single video for the campaign, rather they made as many videos as there were participants in the whole campaign itself. In just two weeks they generated 43 hours of unique audiovisual content, with a 38% participation rate, while each shared video achieved an average of five new videos, and a total of 427 viewing hours on users’ walls. * This campaign is 85% co-financed by the European Regional Development Fund (FEDER).